Witnessing the Black Lives Matter (BLM) movement is a flashback to middle school lessons about the civil rights movement. Both are shaped out of the injustices faced by the black community and the political or judicial system’s unwillingness to rightfully address the injustices over time. Millennial students are more than willing to be involved in the BLM, recognizing that many of history’s most influential black figures grew out of the civil rights movement. That puts us on the frontlines of today’s social causes. The movement offers all students a voice, a platform, and a drive for transformation. Today’s movement does not just involve the black community or is confined by the boundaries of racial injustices. We students acknowledge legacy and history and North Carolina A&T students continue to reinforce that creed. The A&T Four set the stage for millennial students today. On Feb. 1, 1960, four A&T freshmen changed history. Ezell Blair Jr. (Jibreel Khazan), Franklin McCain, Joseph McNeil, and David Richmond carried out a sit-in at a whites-only lunch counter at Woolworth’s in downtown Greensboro, North Carolina. The four men were refused service, yet stayed until the store closed. The nonviolent sit-ins did not begin at A&T; they had been going on before the 1960 incident. But the A&T sit-in brought the protests national attention. That spotlight led to increased support across the nation as other cities followed with sit-ins and demonstrations. Woolworth’s was desegregated in July of the same year, and the passage of legislation such as the Civil Rights Act of 1960 and the Supreme Court ruling that racial segregation in public transportation was illegal are rooted in the legacies of the A&T Four. Aggies turned individual passions into actions, and actions into legacy. Two weeks ago, A&T students marched in memory of Keith Lamont Scott, an unarmed black man fatally shot and killed in Charlotte, North Carolina, by a law enforcement officer. As students at a historically black college and university, A&T students are ignited into action when members of their community take a bullet from the very people who are sworn to protect them. 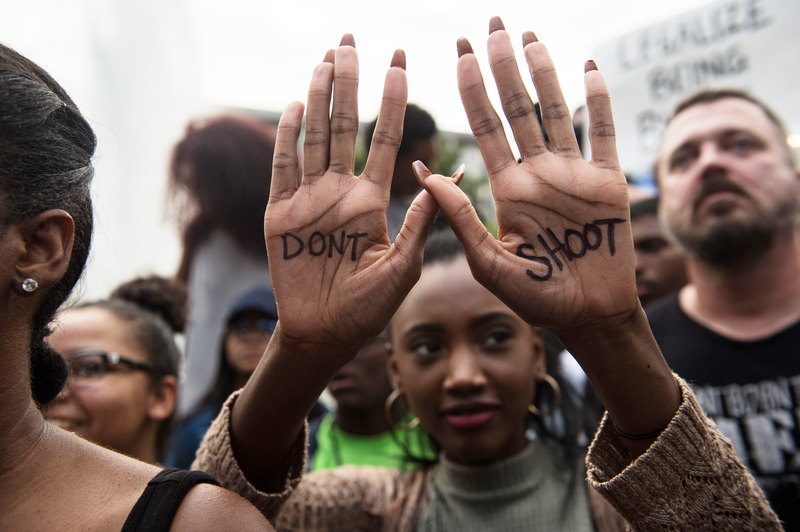 A protester holds up her hands with a slogan written on them during a demonstration against police brutality in Charlotte, North Carolina, on Sept. 21, following the shooting of Keith Lamont Scott the day before. Students at this institution refuse to leave discussions about societal issues in the classroom; instead, we use them as fuel for influence and change in today’s world. Scott’s unfortunate death left a mark in history, and now it’s time to leave our own by reinforcing that black lives do matter and will always matter even if our world does not reflect the same notion. Aggies gathered for a typical Thursday night football game on Sept. 29, but instead of a sea of blue and gold, the student section was all black and gold. A letter from Student Government Association president Jordan Greene encouraged the student body to wear the clothing in support of tragedies within the black community with a special focus on the deaths of unarmed black men and women. When the national anthem played, Aggies took a “unified kneel,” modeling San Francisco 49ers quarterback Colin Kaepernick. At any cost, an Aggie is a voice for his or her community, a risk-taker for a cause, and a challenger of the status quo. Real strength is Aggie strength. On Oct. 2, A&T lost two of its students to gun violence off campus. Alisia Dieudonne, 19, and Ahmad Campbell, 21, were shot and killed at a house party. Alongside the university’s normal safety notifications, the chancellor released a personal letter out of respect for students’ lives and the safety of our campus. Hours after students were notified of the tragedy, a safety forum was held. The student body, as well as university officials, demonstrated “Aggie Pride” in the form of Aggie strength. We came together to host an honest discussion over police protection and campus safety in the midst of mourning over our fallen Aggies. To demonstrate unity and recognize the devastating effects of gun violence, several vigils and memorials were held throughout the week in honor of the two students. Although the tragedy cost two students their lives, the aftermath showed our strength. The history of this tragedy will write itself, and the legacy of Aggie unity is engraved in the hearts of every young student of the institution. The calamity within our community raises the bar for those who want to be on the frontlines of history. The more we students witness movements such as Black Lives Matter, and similar events and protests, the more true leaders will become emboldened to face social issues and tragedies head on. North Carolina A&T students, known as Aggies, respond to these issues without hesitation. “Aggie Pride” is not just a fun slogan to repeat, but a representation of Aggies’ unrelenting efforts to change themselves for the sake of changing their legacy and shaping history. Jacqueline Alston is a junior public relations major in the Journalism and Mass Communication Department at North Carolina A&T.